Pictorial Library of Bible Lands — This Web site contains a large number of pictures with short descriptive texts for each. The intent of the Web site is of a commercial nature, but the freely accessible resources in this online version of the Pictorial Library of Bible Lands make of it a useful reference tool. Look under the heading "The Sites" in the navigation menu for pictures, commentaries and listing of other Web sites on dozens of places mentioned in the Bible. The lastest edition of the The Latest Scoop is now online - This is a regularly-updated column with the latest information on textbooks and their revisions gleaned from the publishers. It is compiled by Deb, the religion product specialist from Communication enter, a full-service distributor of textbooks and Bibles to Catholic churches and schools around the country. The diocesan resource center of the Diocese of Reno has over 4000 books and 500 videos. Their Web site has made available a commented bibliography of all of these resources providing a short description for each of them. This online reference is organized by topics and provides a valuable tool to help you discover useful resources. The monks of the Abbey of Our Lady of the Prairies have welcomed artists from the St. Norbert Arts Centre into their archival history. Here we have found a story of peace, a community of love and devotion, an ancient way of life guided by the principles of simplicity, self-sufficiency and prayer. Join us as we discover a spiritual journey through the humble daily life of a 21st Century monk. Catechist’s Journey is a new blog maintained by Joe Paprocki who was a religion teacher at a high school seminary, a director of religious education and a pastoral associate at a parish, the consultant for catechist formation on to the Office for Catechesis of the Archdiocese of Chicago, and is now working for Loyola Press. "Catechist's Journey is the place for conversations about teaching the Catholic faith. I'll talk about my experiences as a catechist, and together we can explore ideas to meet the challenges and rewards of this ministry in which we are privileged to serve." The blog has been in existence for just over a month and already contains much that is of interest to catechists. This is one new resource to bookmark and to visit regularly! CRS Education: Going Global with Youth is a gateway to lesson plans, simulation activities, prayer services, stories, web links and opportunities that looks at global issues through the lens of Catholic Social Teaching. Use this resource to invite young people to see the world with new eyes and to challenge them to respond to our faith call to global solidarity. "How to Reach Inactive Catholics" is a Pastoral Statement written by Bishop Michael A. Saltarelli of the Diocese of Wilmington in 2000. Bishop Saltarelli cites 9 of the reasons diagnosed by the Bishops' Evangelization Committee on why Catholics become inactive. He reflects on how the Church can respond to each of these. We live in an age filled with seekers in their twenties and thirties who are desperately trying to find deeper meaning in their lives but whose journey has little to do with traditional religious institutions. BustedHalo.com believes that the experiences of these pilgrims and the questions they ask are inherently spiritual. Based in wisdom from the Catholic tradition, we believe that the joys and the hopes, the griefs and the anxieties of the people of this age are the joys and hopes, the griefs and anxieties of all God’s people. Nothing genuinely human fails to raise an echo in their hearts. BustedHalo.com strives to reveal this spiritual dimension of our lives through feature stories, reviews, interviews, faith guides, commentaries, audio clips, discussions and connections to retreat, worship and service opportunities that can’t be found anywhere else. How to Pray explores various forms of prayer. The blog described below and found at http://godzdogz.op.org/ was launched at the beginning of this month (december 3, 2006). I find it to be an exciting and rich new resource. This is certainly partly because my studies in philosophy and theology at a Dominican college have given me an awareness and appreciation of the rich tradition handed down by the Dominicans. It is also because the blog, even after so short a lifespan, is already rich in beautiful images, Gregorian chant sound files, solid commentaries on daily scriptures, inspiring meditations... I highly recommend you take time to explore this blog! 1) Preaching: As brothers (friars) of the Order of Preachers, this is why we exist! From the earliest days of the Order, we preached the truth of Jesus Christ to the world, bringing the light of faith in Him, to all who seek truth and long for God. This section will contain preaching by the students and other Dominican friars in written and audio-visual media. 2) Prayer: The Dominican life considers preaching as handing on the fruit of our contemplation. Prayer and contemplation, particularly in the solemn celebration of the Liturgy, is a focal point in the day of a Dominican friar. 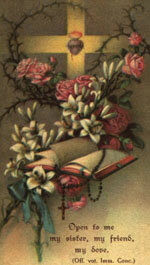 This section will offer prayerful reflections and writings on Dominican spirituality. 3) Study: Assiduous attention to the Word of God, by which we are enabled to preach Christ and through which we contemplate Him, is a vital part of the Dominican life. This section will have articles related to our study, as well as give you a chance to ask questions of our friars, in a virtual 'Quodlibeta'! 4) Community: We live in priories - there are seven such houses of Dominican friars in Britain. Community life is the rich soil in which all the above take place; it helps to keep our feet on the ground and inspires us to be brothers to one another. Together, we praise, bless and preach Jesus Christ. This section will share with you events, news and photos of the Studentate. " The online version of Religion Teacher's Journal from Twenty-Third Publications offers free articles from the current issue as well as a selection of features from past issue, plays for your classroom, stories and teen topics. The Vatican Web site now has the complete version of the Compendium of the Social Doctrine of the Church, that "has been drawn up in order to give a concise but complete overview of the Church's social teaching." "The reading of these pages is suggested above all in order to sustain and foster the activity of Christians in the social sector, especially the activity of the lay faithful to whom this area belongs in a particular way; the whole of their lives must be seen as a work of evangelization that produces fruit. Every believer must learn first of all to obey the Lord with the strength of faith, following the example of Saint Peter: “Master, we toiled all night and took nothing! But at your word I will let down the nets” (Lk 5:5). Every reader of “good will” will be able to understand the motives that prompt the Church to intervene with her doctrine in the social sector, an area which, at first glance, does not belong to the Church's competence, and these same readers will see the reasons for an encounter, for dialogue, for cooperation in serving the common good." "The Center for Ministry Development is an independent, non-profit organization whose core purpose is to bring the Good News in new ways to the people of God. Our mission is to empower faith communities and their leaders for effective ministry with adolescents, young adults, and families through ministry education for leaders, ministry development training and resources, programs, and publications. The Center is funded through a combination of fees for services, publication sales, and foundation grants." This web resource is a partnership between Church Resources and the Loyola Institute to provide resources fostering a faith that does justice. This page on the Web site of the Archdiocese of Toronto offers a large selection of useful resources. The introduction to this page reads as follows: "We express our faith through public worship in the liturgy of the Word and Eucharist, song, prayer, devotions, sacred rites and the Sacraments. The resources below help tell the story of our sacred traditions." 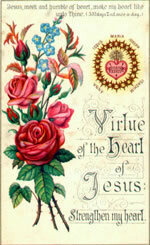 Catholic Digital Images - ChantArt now offers its extensive collection of Catholic digital Images free of cost. The site contains 5296 images in 129 categories. Below are two graphics gleaned from one of the categories available on the site. If you have not already done so, you will need to open an account. The process to download one or several images is simple. When you find an image you would like to download, click on it. Then click on the button "Add to cart". Repeat this process as often as you like. When you have selected all of the images you are interested in downloading in a specific session, click on "Shopping Cart" in the menu bar near the top of the page. Cost will indicate $0.00. You will then be able to download the entire selection of images you chose in a zip file and these will be in large format that you can then format for your needs. The Web site relies completely on revenues from Google sponsors to survive so I would encourage you to click on one or two Google ads when you visit the site to support the efforts of webmaster Julie Ann Brown. You might also want to write to her at catholicdigitalimages@gmail.com as well to let her know how you are using the images. "...a new literary magazine dedicated to providing a space for young writers to engage the literary world from a Catholic perspective. The magazine is committed to quality writing that takes advantage of the religious, theological, philosophical, artistic, cultural, and literary heritage of the Catholic Church in order to inform and enrich contemporary literary culture. Dappled Things pledges complete faithfulness to the teachings of the Catholic Church as expressed by the Bishop of Rome and the Church's Magisterium." I find the wonderful mix of fiction, poetry, essays, art, and photography make of this magazine a delightful place to visit and rest a while... And the quality of the works presented is indeed high. How can Catholics take back “holy” Halloween and use the holiday as a time for evangelization? Listen to American Catholic Radio to find out. One of the features on the site is quite innovative and and could be fun to use in creating resources for your students. Under the Clip Art section of the site, there is a page called "My Name". On that page you can write the name of one your students in a form and simply click on "Create Image" and the name you have written will be integrated in a graphic that says "Name" loves Jesus. I have done this with my first name in the graphic above. You could do that for all of your students, and save the images to use on individualised worksheets or any handout for that matter. 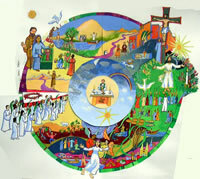 interparole-catholique-yvelines.cef.fr - This French Web site has all you need to build a beautifully illustrated yearly liturgical calendar to color, cut ut and assemble with your students. If you cannot read French, it would still be worthwhile to use an online translator to make out the meaning of the sections "Pourquoi un calendrier liturgique ?" (Why a liturgical calendar) and Tableau récapitulatif de l'année liturgique (Summary table of the liturgical year). Both of these provide useful and interesting background information on how to help children understand the different liturgical seasons and feast days and their meanings.